Don Quixote research papers show that Don Quixote enables a thorough analysis of the chivalric and Christian values throughout the text. Don Quixote research papers show that Don Quixote enables a thorough analysis of the chivalric and Christian values throughout the text. The dual value systems reflected upon in the research paper about Don Quixote resemble one another in numerous ways. The systems provide hope for people in need of reasons to have hope. Rather than characterize the book as a fable, allegory paints a more complete picture of the wide-ranging book. Chivalry and traditional religion parallel each other and have avoided total obsolescence. Don Quixote’s efforts did not go unnoticed. He influenced people’s ways of viewing many things. The reading of Don Quixote provides a look at moral implications and what virtues fall outside chivalric or Christian values. The frequent use of two words, “discretion” and “humor”, illustrate the dynamic of these two value systems. Numerous references to values present a mixed moral picture. Chivalric and Christian values overlap on many occasions, but on some occasions do not. 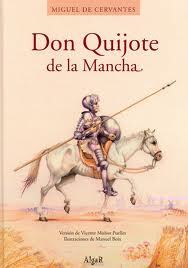 Cervantes, through the character Don Quixote, stretches the values typically associated with chivalry and Christianity. “Discretion” and “humor” often appear in the text as related qualities that a chivalrous knight must possess. Labeling the book as a fable does a disservice to the depth of the story. Cervantes expounds on a multitude of levels well beyond the definition of a fable. Limiting discussion of this book to a single lesson also detracts from the variety of lessons portrayed. Inherently the range of moral codes encountered conflict. Incompatible moral codes do not hinder Don Quixote as he attempts to transform the world. His adherence to the moral codes enables him to successfully transform at least part of the world. A Coney Island of the Mind - Ferlinghetti continues with an allusion to Don Quixote's false windmills, and the alliterative hyperbole, "freeways fifty lanes wide/on a concrete continent. Brooks' Irony as a Principle of Structure - Irony also plays an important role in this poem. Ferlinghetti continues with an allusion to Don Quixote's false windmills and an alliterative hyperbole. Paper Masters writes custom research papers on Don Quixote and show that Don Quixote enables a thorough analysis of the chivalric and Christian values throughout the text.